Northwestern Engineering’s James Rondinelli has been selected to receive the Outstanding Young Investigator Award from the Materials Research Society (MRS). The award recognizes outstanding, interdisciplinary scientific work in materials research by a young scientist or engineer who shows exceptional promise as a developing leader in the materials area. Rondinelli is the Morris E. Fine Junior Professor in Materials and Manufacturing at Northwestern’s McCormick School of Engineering. He has made seminal contributions in computational condensed matter physics and novel materials design approaches. In his Materials Theory and Design Group, Rondinelli manipulates materials at their fundamental electronic level, pushing electrons to do new things in materials and to realize new functionalities by designing materials atom by atom. Since joining Northwestern in 2014, Rondinelli has received several significant awards, including a 2016 Alfred P. Sloan Research Fellowship, 2016 Presidential Early Career Award for Scientists and Engineers, and 2015 National Science Foundation CAREER Award. 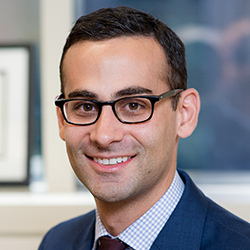 Rondinelli’s Outstanding Young Investigator Award marks the fourth time a Northwestern professor has received the MRS honor. Mark C. Hersam, Walter P. Murphy Professor of Materials Science and Engineering, received the award in 2010; Teri Odom, Charles E. and Emma H. Morrison Professor of Chemistry and (by courtesy) professor of materials science and engineering, won in 2009; and Chad Mirkin, George B. Rathmann Professor of Chemistry, was honored in 1999.